Is this a Brown Dwarf or an Exoplanet? Since the discovery in 1995 of the first planet orbiting a normal star other than the Sun, there are now more than 150 candidates of these so-called exoplanets known. Most of them are detected by indirect methods, based either on variations of the radial velocity or the dimming of the star as the planet passes in front of it. Astronomers would, however, prefer to obtain a direct image of an exoplanet, allowing them to better characterize the object's physical nature. This is an exceedingly difficult task, as the planet is generally hidden in the "glare" of its host star. To partly overcome this problem, astronomers study very young objects. Indeed, sub-stellar objects are much hotter and brighter when young and therefore can be more easily detected than older objects of similar mass. Based on this approach, it might well be that last year's detection of a feeble speck of light next to the young brown dwarf 2M1207 by an international team of astronomers using the ESO Very Large Telescope (eso0428) is the long-sought bona-fide image of an exoplanet. A recent report based on data from the Hubble Space Telescope seems to confirm this result. The even more recent observations made with the Spitzer Space Telescope of the warm infrared glows of two previously detected "hot Jupiter" planets is another interesting result in this context. This wealth of new results, obtained in the time span of a few months, illustrates perfectly the dynamic of this field of research. Now, a different team of astronomers  has possibly made another important breakthrough in this field by finding a tiny companion to a young star. Since several years these scientists have conducted a search for planets and low-mass objects, in particular around stars still in their formation process - so-called T-Tauri stars - using both the direct imaging and the radial velocity techniques. One of the objects on their list is GQ Lupi, a young T-Tauri star, located in the Lupus I (the Wolf) cloud, a region of star formation about 400 or 500 light-years away. The star GQ Lupi is apparently a very young object still surrounded by a disc, with an age between 100,000 and 2 million years. The astronomers observed GQ Lupi on 25 June 2004 with the adaptive optics instrument NACO attached to Yepun, the fourth 8.2-m Unit Telescope of the Very Large Telescope located on top of Cerro Paranal (Chile). The instrument's adaptive optics (AO) overcomes the distortion induced by atmospheric turbulence, producing extremely sharp near-infrared images. As the image shows, the series of NACO exposures clearly reveal the presence of the tiny companion, located in the close vicinity of the star. This newly found object is only 0.7 arcsecond away, and would have been overlooked without the use of the adaptive optics capabilities of NACO. At the distance of GQ Lupi, the separation between the star and its feeble companion is about 100 astronomical units (or 100 times the distance between the Sun and the Earth). This is roughly 2.5 times the distance between Pluto and the Sun. The companion, called GQ Lupi B or GQ Lupi b , is roughly 250 times fainter than GQ Lupi A as seen in this series of image. Further images obtained with NACO in August and September confirmed the presence and the position of this companion. The astronomers then uncovered that the star had been previously observed by the Subaru telescope as well as by the Hubble Space Telescope. They retrieved the corresponding images from the data archives of these facilities for further analysis. The older images, taken in July 2002 and April 1999, respectively, also showed the presence of the companion, giving the astronomers the possibility of precisely measuring the position of the two objects over a period of several years. This in turn allowed them to determine if the stars move together in the sky - as should be expected if they are gravitationally bound together - or if the smaller object is only a background object, just aligned by chance. From their measurements, the astronomers found that the separation between the two objects did not change over the five-year period covered by the observations. For the scientists this is a clear proof that both objects are moving in the same direction in the sky. "If the faint object would be a background object", says Ralph Neuhäuser of the University of Jena (Germany) and leader of the team, "we would see a change in separation as GQ Lup would be moving in the sky. From 1999 to 2004, the separation would have changed by 0.15 arcsec, while we are confident that the change is a least 20 times smaller." 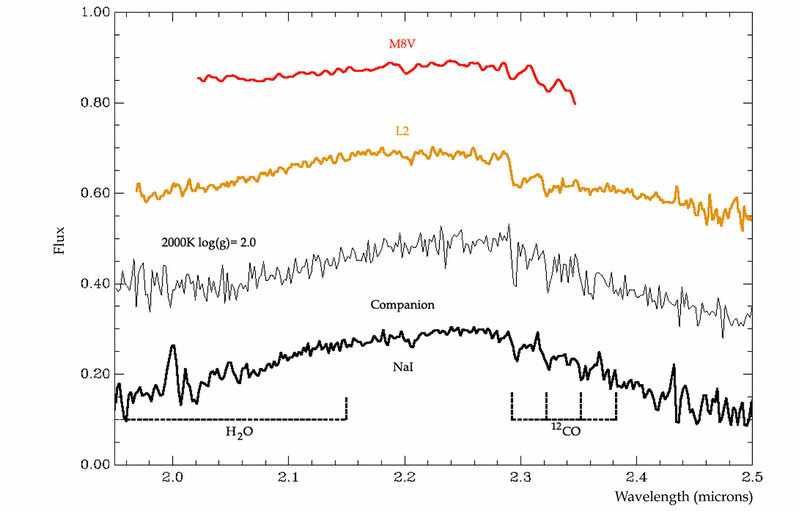 To further probe the physical nature of the newly discovered object, the astronomers used NACO on the VLT to take a series of spectra. These showed the typical signature of a very cool object, in particular the presence of water and CO bands. Taking into account the infrared colours and the spectral data available, atmospheric model calculations point to a temperature between 1,600 and 2,500 degrees and a radius that is twice as large as Jupiter (see ESO Press Photo eso0511). According to this, GQ Lupi B is thus a cold and rather small object. But what is the nature of this faint object? Is it a bona-fide exoplanet or is it a brown dwarf, those "failed" stars that are not massive enough to centrally produce major nuclear reactions? Although the borderline between the two is still a matter of debate, one way to distinguish between the two is by their mass (as this is also done between brown dwarfs and stars): (giant) planets are lighter than about 13 Jupiter-masses (the critical mass needed to ignite deuterium fusion), brown dwarfs are heavier. What about GQ Lupi b? Unfortunately, the new observations do not provide a direct estimate of the mass of the object. Thus the astronomers must rely on comparison with theoretical models of such objects. But this is not as easy as it sounds. If, as astronomers generally accept, GQ Lupi A and B formed simultaneously, the newly found object is very young. The problem is that for such very young objects, traditional theoretical models are probably not applicable. If they are used, however, they provide an estimate of the mass of the object that lies somewhere between 3 to 42 Jupiter-masses, i.e. encompassing both the planet and the brown dwarf domains. 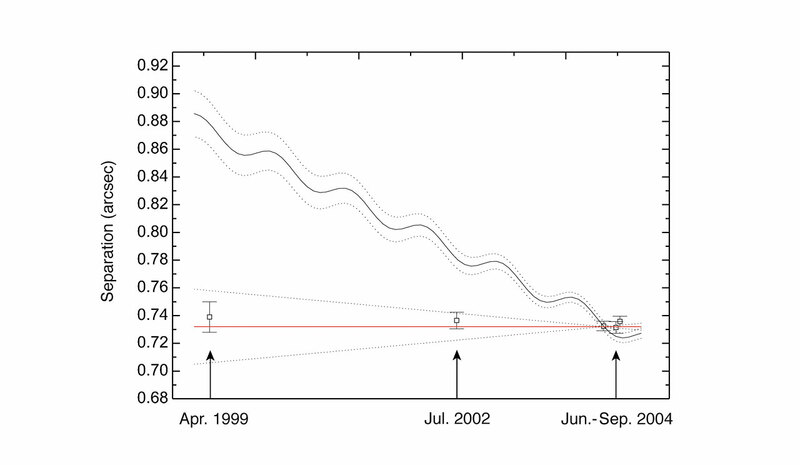 These early phases in brown dwarf and planet formation are essentially unknown territory for models. It is very difficult to model the early collapse of the gas clouds given the conditions around the forming parent star. One set of models, specifically tailored to model the very young objects, provide masses as low as one to two Jupiter-masses. But as Ralph Neuhäuser points out "these new models still need to be calibrated, before the mass of such companions can be determined confidently". The astronomers also stress that from the comparison between their VLT/NACO spectra and the theoretical models of co-author Peter Hauschildt from Hamburg University (Germany), they arrive at the conclusion that the best fit is obtained for an object having roughly 2 Jupiter radii and 2 Jupiter masses. 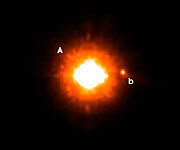 If this result holds, GQ Lupi b would thus be the youngest and lightest exoplanet to have been imaged. Further observations are still required to precisely determine the nature of GQ Lupi B. If the two objects are indeed bound, then the smallest object will need more than 1,000 years to complete an orbit around its host star. This is of course too long to wait but the effect of the orbital motion might possibly be detectable - as a tiny change in the separation between the two objects - in a few years. The team therefore plans to perform regular observations of this object using NACO on the VLT, in order to detect this motion. No doubt that in the mean time, further progress on the theoretical side will be achieved and that many sensational discoveries in this field will be made. The team is composed of Ralph Neuhäuser, Günther Wuchterl, Markus Mugrauer, and Ana Bedalov (University of Jena, Germany), Eike Guenther (Thüringer Landessternwarte Tautenburg, Germany), and Peter Hauschildt (Hamburger Sternwarte, Germany). In the astronomical literature, the convention is to put capitals for stars member of multiple systems, but small letters for planets. If the companion to GQ Lupi A turns out to be a planet, it would be called GQ Lupi b, while if it is a brown dwarf, it would be identified as GQ lupi B. Given the present uncertainty, we have therefore used both denominations in this press release, as did the authors in the original scientific paper. The research presented in this ESO Press Release is published in a Letter to the Editor accepted for publication by Astronomy and Astrophysics ("Evidence for a co-moving sub-stellar companion of GQ Lup" by R. Neuhäuser et al.) and available in PDF format.